…already condemned and no other beliefs…! Condemned Already for not believing! You make Jesus/God a liar! Condemned for preaching a different Gospel! 18 The one who believes in him is not condemned. the one and only Son of God. God that he has testified concerning his Son. not have this eternal life. has crossed over from death to life. you, let him be condemned to hell! to the resurrection resulting in condemnation. …you make God/Jesus a liar, for not believing! WHERE DID YOUR SELF-DETERMINATION GO TO? Condemned for preaching a different Gospel, thus believing another Religion! THIS COUNTERS FREEDOMS OF RELIGIONS AND BELIEFS AND COMMON LAWS! HENCE THE BIBLE IS TECHNICALLY “ILLEGAL”…! It does not comply with Laws and common sense! HOW CAN THIS GOD BE THE ONLY ONE, WITH SUCH LOGIC of DRACONIAN LOGIC? 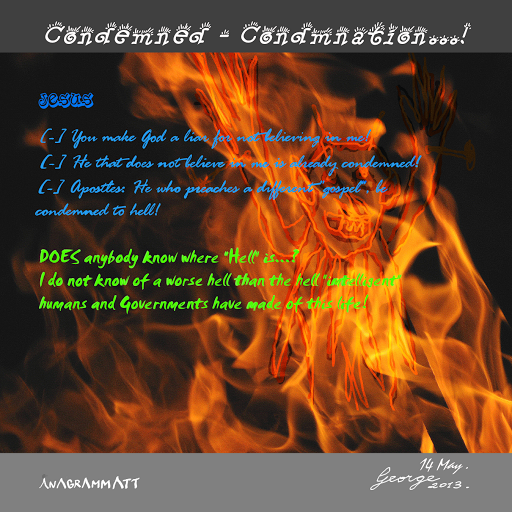 To believe and make a hell an lake of fire and eternal damnation…! HOW CAN ANY GOVERNMENT “SWEAR” OVER THIS BIBLE? HOW CAN ANYBODY STUDY THIS IN ACADEMIA TO EVEN A LEVEL OF PhD, being so void of “common sense”, contrary to the Faculties of Law and Philosophy…? DOES anybody know where “Hell” is…? I do not know of a worse hell than the hell “intelligent” humans and Governments have made of this life! The sad most or highly probable truth! [-] If it narrates of a draconian resurrection to “automatic no second chance”, and “already” condemnation for “merely not believing” and exclusive for a few “believers” to life in heaven, we get the verdict! [-] And we cannot all be sinners by blood, minds, and from our parents, or as said: Adan and Eve! Draconian God rules and the Apostles writings, disprove this kind of resurrection, to a hell that cannot be accepted logic! It is too extreme! Too much time! Too much suffering beyond this life’s suffering! THIS IS WHY THE CATHOLIC CHURCH, invented the “purgatory”, on the basis of a second chance, and not so extreme…! [-] A true Resurrection would be to a much more intelligent number of Gods and with much better logic…! THIS BIBLE RESURRECTION AFTER DEATH, IS “hokus pokus” BOGUS…! SORRY WORLD, YOU HAVE BEEN DUPED…! AND POLITICIANS DO NOT WANT YOU TO HAVE THIS ANALYSIS NOR MY BOOKS! ← …Secrets of the Moon! Merely Science…!